I first met Clay Richart about ten years ago when we both worked at Amazon.com. He’s a fairly laid back guy with an incredible music collection. We got along well. Thanks for Facebook, we’re still in touch. Since then he’s moved on to bigger and better things much like I have. 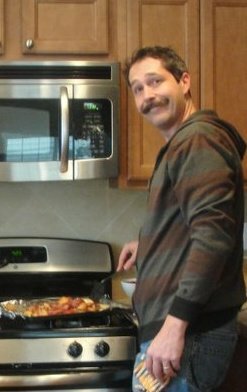 The big difference being that he’s making candies with bacon in them and he has an Awesome mustache. Since five questions about a mustache would be somewhat dull, I decided I’d ask him about Fingerprint Confections, the new candy business he’s started with his wife, Holly. 1. How did you and your wife start Fingerprint Confections? I came across spicy candied Bacon through a friend of Holly. You dredge Bacon in sugar and chili pepper, and bake it. It comes out all candy coated and amazing. We were making this like all the time, kids parties, afternoon snacks, you name it… I was commenting on how we needed a different delivery method for this flavor, and the wife mentioned candy. 2. What varieties have you made so far? 3. What’s your most memorable moment so far in this enterprise? Some of the most memorable moments are really hard to remember. We have pulled a few all night scrambles to put the finishing touches on some special orders. I really like that Holly and I are able to collaborate in a way that we really never had before. 4. Where can people get your candies? 5. What’s next for Fingerprint Confections? I’d like to thank Clay for taking the time to participate in 5 Question Friday and for making one more thing with bacon in it, though honestly, I like the sea salt ones better. Originally, I started writing about homicides in Tacoma because of Tacoma’s reputation as a city of crime. Tacoma has a long and colorful history of crime and corruption. That history continues, but when it comes to homicides, Tacoma really isn’t as dangerous as it used to be. 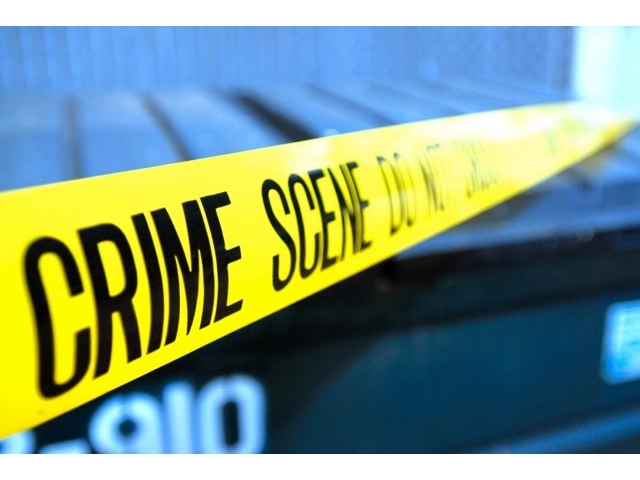 Crime rates have dropped significantly since the 1990s. My original purpose was to show that there really aren’t that many homicides in Tacoma. Usually about one a month. Since most media reports tend to focus on the killer, I chose to focus instead on the victim. Personally, I don’t think killing someone should make you a household name. So whenever possible, I don’t mention the name of the killer. Another aspect of it is that the victim is usually forgotten and little if anything is written about who the person was. I wanted to write about these people who could no longer share their story, whatever their story was. Soon after I started doing this, I found a new purpose in writing about these murders. I found that friends and relatives of the victim would often contact me. Some would be old friends who hadn’t seen the victim in years and only found out they had died through a Google search that found my site. Others would be mothers, wives, fathers and children of the victim. It became clear that what I was doing mattered to some people. There was also the flipside of that coin. Particularly when gangs were involved, I’d get other messages. I’d get threatening emails. Once I got one with information only someone directly involved with the killing would have known. I forwarded that one on to the police. At the time, it occurred to me that while some liked what I was doing there were others who didn’t and some of those others were killers. And so I stopped for a few years. During that time, I’d occasionally reread the emails from the friends and relatives of victims. I was contacted by one who asked me if I could find the name of the person who killed a woman a few years ago. It took a bit of research since I don’t mention killers, but the person who wrote me wanted to know who killed her mother. I sent her the information I had. I was reminded that what it comes down to is that the victims can no longer tell their story and someone should. I started writing about Tacoma homicides again in 2011. I plan on continuing to do so for the foreseeable future. Because there have to be limits on something like this, I only write about homicides that occur in the city limits of Tacoma. I include police involved shootings because I am told that they are counted in official homicide statistics and because those victims have a story too. I don’t include vehicular homicides because they are much more difficult to write about. Often charges aren’t filed until much later, and writing about everyone who is killed in a car accident in Tacoma goes a bit outside of what this is for. When writing about these crimes, I use whatever information is available to me at the time. I read newspaper articles, news sites and television news broadcasts. I also use whatever personal knowledge I might have of the victim, the area or any other information I might have. Whenever possible, I try to write it with a sympathetic ear towards the victim. This year, that’s been a bit difficult. There were two police involved shootings and two instances where a homeowner shot intruders in their house. While it’s debatable whether they were justifiable or not, there were no charges filed in these cases and in each of them, it’s understandable why events occurred the way they did. I’m not a reporter. I’m not objective. I do have an opinion on each homicide I write about. I try not to let that influence me too much, but it’s impossible to keep my bias out of something I write. I’ll be the first to admit that occasionally I get it wrong. Often this is due to a lack of information on the case at the time that I’m writing about it. This is why I tend to wait until the name of the victim is released. Usually by that time, the story of what happened is out there and reasonably complete. It’s my hope that telling these stories helps those who have lost someone and gives others a better picture of people Tacoma has lost. Photo Courtesy of Pierce County Sheriff. On the morning of Saturday, October 22, Aaron Westby was loading suitcases into a truck in the alley near South 19th and Yakima Street. Aaron was a known car thief. 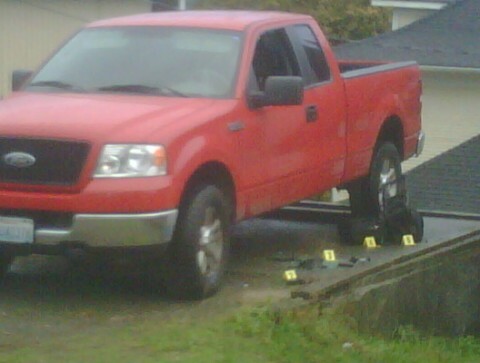 The bright red Ford truck had been stolen Friday with a gun inside it. Two uniformed Pierce County officers approached him. He was known well enough from his previous encounters with police that these two knew him by sight. Aaron continued to load the suitcases as they approached. He knew he had a warrant out for his arrest. He also knew that this would be his third strike and he’d likely be facing life in prison if they arrested him. So he told them that they would not be arresting him. When they got to him, there was a bit of a struggle. Eventually he got free and got into the truck. One of the officers broke the window. They used a taser on him, but it didn’t seem to stop him. According to the officers, he reached into the glove box and told them he had a gun. One of the officers shot once, killing Aaron Westby. This, it would turn out, would be the second of four police involved shootings in Western Washington this weekend. The first shooting happened in Grey’s Harbor County when an inmate receiving medical treatment attempted to escape, taking a hostage with the butter knife. Less than 24 hours after Aaron Westby’s death, officers in Lakewood shot an armed man at a party. Then on Sunday, in Seattle’s Belltown, a homicide suspect was shot on Cedar Street. Aaron Westby was facing life in prison as a result of an extensive criminal record. He had a history of running from the police. The stolen truck he was using was reported to have a gun in it. While, it will be months before any investigation into this will be concluded, it’s safe to say that any charges against the officers are unlikely. Since 2009, when six officers local officers were killed in the space of a few months, four of them in an ambush in Lakewood at a coffee shop, local police have been much more willing to use lethal force. This isn’t news to anyone around here. From the information on hand about Aaron Westby’s death, it would appear he preferred to run and risk death rather than face life in prison. This was an unfortunate loss of life, but one that could have been easily prevented by Westby simply complying with the officers. I’ve talked with a lot of cops. Some of them are personal friends. Not one of them wakes up wanting to shoot someone. That said, most of them are more than willing to if it means saving lives or saving their own life. For some the action haunts them forever. For others, it’s just part of the job. A search of the truck found that there was no gun inside. Aaron Westby’s last threat was a hallow one. Did he say it knowing the officers would shoot? The more cynical might even ask if he said it at all? Aaron Westby made it clear he wasn’t going back to prison and he was right. Occasionally, I let others do 5 Question Fridays for TacomaStories.com. Luke Byram has previously contributed to Tacoma Stories with 5 Question Fridays from Amanda Westbrook and Kathleen Merryman. This week, he’s back with a 5 Question Friday with Frank Blair. Who is Frank Blair? I’ll let Luke and Frank answer that question. Frank Blair has been an active member of Tacoma for a while. He has been the facility manager of Manitou Community Center and was involved in the community garden which was created there. Frank’s daughter, Sheena was killed by a drunk driver in February of 2010 in Everett. Ever since that dreadful night, he’s been on a crusade to stop DUI crashes and stiffen penalties of drunk drivers. Lets find out how he has and is accomplishing this task. Without further ado, here’s Frank’s responses to a set of 5 questions that we put to him. 1. 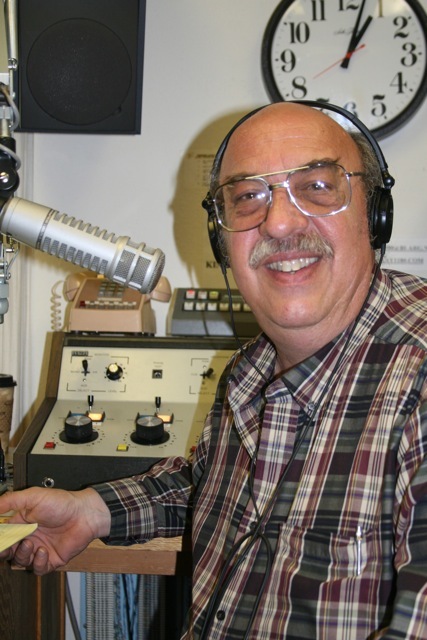 How long have you been co-host of Equal Time on KLAY 180 FM? I have never done Equal Time on 180 KLAY. But I HAVE been co-host on 1180 KLAY in various incarnations since 1999. GREAT time to start a liberal talk show, just as the bush administration was taking office. 2. What subjects/topics do you cover on Equal Time? Equal Time is primarily a political talk show. We have also covered everything from gardening to local artists, film makers, authors, organized labor and veteran’s issues. 3. Who’s been your favorite guest on Equal Time? I think the greatest honor I ever had as a broadcaster was an hour long in-studio interview with General John Shalikashvili. This interview took place just before the war in Iraq was launched. 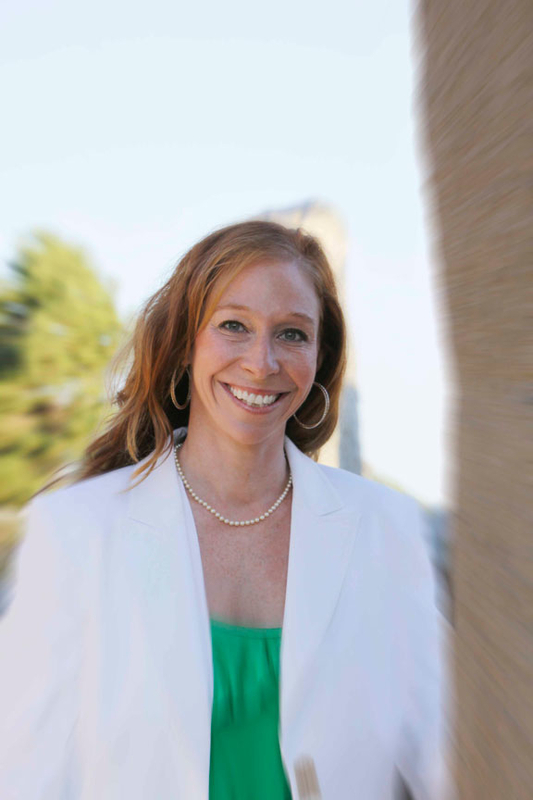 I also hold dear our interviews with Dr Jeni Gregory, a trauma councilor who works with children traumatized by war. She works with child soldiers in Africa and has done work with other children in horrid situations around the world. 4. How are you working on preventing DUI wrecks? My wife Carol and I are working to prevent DUI deaths in a three pronged approach. First, working with legislators to increase penalties for DUI and vehicular homicide to deter a percentage of the population from taking the chance to drive impaired. Second, through education in the sense of sharing how Sheena’s death has impacted and continues to impact our family. Third, and most importantly, providing viable alternative to driving drunk in the first place. We support programs to get impaired drivers home at low or no cost. 5. Why are you on a mission to prevent DUI wrecks? We became active with DUI issues because our daughter Sheena was killed in a head on collision at the hands of a drunk driver. That night we were shoved into a line with thousands of other families of DUI victims in front of us. We feel that it is our moral obligation to shorten the line behind us. Every DUI vehicular homicide that we see on the news sickens us. Many people express that “Somebody should DO something”. Sometimes that “someone” is ME. I first met Jamie Chase many years ago. There are people you meet and you forget about them. If life were a movie, they’d be an extra. Jamie Chase could never be that. She’s smart, outspoken and willing to back up what she thinks with action. She’s exactly the sort of person I want participating in 5 Question Friday and amazingly enough, she took the time to indulge me. With all the talk about corporate greed and big banks, I can think of no better time to start talking about credit unions. And there’s really no one better to do that than Jamie Chase. Here she is. 1. For those who don’t know, what are the major differences between a bank and a credit union? Credit unions are not-for-profit service organizations. They exist to provide a community service. Banks are profit driven companies. In this environment banks are profit maximizing. Banks make choices to make the most profit possible for their business. Credit union make choices to give the best service possible. Credit unions are member-owned cooperatives, like the Tacoma Food Co-op, REI, USAA, and PCC. The member-owners elect volunteers to represent them, to protect them. As a result, the volunteer board of directors make sure the credit union never makes choices like Bank of America did this week to charge $9 a month to use a branch and $5 a month to use a debit card. This is one reason, beyond being not-for-profit, why credit unions do not have sky-high fees on credit cards and didn’t trick people into buying houses they couldn’t afford. 2. BofA and Citibank have both announced monthly fees for use of debit cards resulting in many people considering credit unions instead. What should a prospective customer look for in a credit union? Given that all credit unions are not-for-profit. They are all a better choice than banks. When a person switches, they should look for a credit union that is located close to their home or work. I also recommend a credit union that is part of the shared branching network. With shared branching, credit unions from all over the country share facilities to give members thousands of convenient locations to perform transactions just as if they were in their home credit union. Imagine Bank of America sharing their branches with Key Bank, hilarious. Yes, credit unions really do this. Why? Because their mission is service. They work together, cooperate, instead of competing. 3. What is CU Strategic Planning? It is a small business located in Tacoma, WA that invents poverty reduction programs deployed through not-for-profit credit unions that serve distressed communities across the United States. We are the number one writer of Department of Treasury, Community Development Financial Institution grants for credit unions. As a result, every year we assist credit unions with obtaining millions of dollars in grants so that they can deploy loans to small businesses to create jobs, moderate and low income people to purchase or maintain affordable housing and for unsecured alternatives to payday loans that move people from debt to asset building. 4. For Tacomans, what credit union(s) would you recommend? My top recommendation is BECU. It has the best rates and along with Seattle Metropolitan Credit Union (SMCU) is the most philosophical for consumers that love the cooperative principles. Harborstone offers the best small business services. TAPCO has the friendliest head teller, Cindy, but they are not part of the shared banking network. Heather at Sound Credit Union’s 38th Street and Pacific Ave. location is one of the best tellers in the state. Express Credit Union and TULIP Cooperative Credit Union serve low income consumers with poor credit scores. If your friends can’t open an account at a mainstream credit union, these credit unions have a special mission to help out. 5. With all of the recent bank consolidations, what do you think the future holds for credit unions? Credit unions are the solution, and that will become more clear to people. Right now, we can all move our car loans and credit card balances to credit unions from the higher interest charging banks. Why would you not do this immediately. Run, don’t walk. The mission of credit unions is, “People helping people to help themselves.” That is exactly what people need. I also see credit unions providing financial education and helping consumers to improve their credit. The new answer for credit unions that may have declined a loan to a consumer in the past will not be, “No, we can’t lend to you. “ It will become, “We can’t give you a loan right now, but if you take this class your credit score will improve and we will give you a loan in two months.” That is very powerful. They do this because they exist only to serve. Withdraw your money. Close your corporate bank account. Use theGo to http://www.findacreditunion.com/ to find a not-for-profit credit union you are eligible to join. Joining the credit union is just like opening an account at a bank, only when you “join” you become an owner/member of the cooperative. Yes, credit unions are cooperative and you are the owner, in addition to being not-for-profit. This is the big ideological difference between the creation, management and motives of credit unions and banks. Ask the credit union to transfer your car loan, credit card balances and mortgage from your various banks into the credit union. You will save hundreds of dollars and pay off the loans faster! Credit union not-for-profit rates are much lower than profit-maximizing banks. This is how you really Occupy from Home. Stop the banks from making money off of YOU! They make their money from the interest you pay on your loans, far more profit than from your debit card fees. Set up online banking, direct deposit and automatic payments that were previously connected to your account at the evil bank. By: Jamie Chase, Instigator of Goodness, and inventor of poverty reduction programs deployed through credit unions across the nation serving distressed communities and underserved populations that are unprofitable to corporate banks.